"sometimes the only time you have is the time before everyone else gets up." "It has been two years, and somewhere on that field I left 35 lbs and all that fear." "Every workout jennifer presents is always different. i have never been bored, and sometimes i wonder where she gets this stuff!" 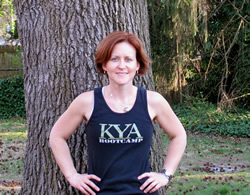 I have been a client of Jennifer Hunt's KYA boot camp for over a year. I started working out with her three times a week around October 2011. When I joined KYA, I had not worked out in a year and had gained about 25 lbs. Not to mention I had zero muscle tone. I am 5' 2" and at the time weighed in at about 150 to 155. When my size 12 jeans were starting to fit snug and I was getting "muffin top," I knew I had to do something. I felt terrible! My first month or so, I could barely do a push up on my knees. Forget a sit up. I was using 5 lb. weights for lifting, and I struggled through my cardio exercises. Still, I showed up to each class determined to get fit. Every workout Jennifer presents is always different. I have never been bored, and sometimes I wonder where she gets this stuff! Jennifer is always excited to have her class try new and challenging exercises (she doesn't expect us to do a workout that she has not already done, so none of this is impossible). If there is an exercise I cannot do (I am 39, so this old body sometimes has an ache or pain), she has many modifications so I won't miss out on the workout. My favorite workouts are stations, the hour just flies by. I can lift heavier weights, push ups are no problem, and I could do sit ups all day. "my energy has returned, i slimmed down two sizes, and my stamina and strength have increased." "I essentially 'cured' my chronic back problem that had plagued me for years." "As a mom who works full-time, i have learned that you have to make time for yourself and sometimes the only time you have is the time before everyone else gets up." When I joined boot camp I had hit my goal of losing 30 pounds using Weight Watchers. I thought boot camp would help me tone up and keep the weight off as I moved into the "maintenance" phase of the Weight Watchers program. In 4 short months not only did I tone up, but I lost an additional 15 pounds! Jennifer's workouts are always different, and even though I have gotten stronger, I am still challenged by every session. Jennifer is also a great motivator. After much coaxing, she finally convinced me to join the Thursday morning cardio group (boot campers who meet up and run/walk together). I had been toying with the idea of running again (I was an avid runner years ago), but was only clocking 1-2 miles every other weekend - if that. Now I am up to 9 miles a week and I am running my first 10K in March. Getting up at 5:00 AM three times a week isn't easy, but it has been totally worth it. As a mom who works full-time, I have learned that you have to make time for yourself and sometimes the only time you have is the time before everyone else gets up. "I am not a morning person, nor do I particularly enjoy exercising. so why do I get up for a 5:30am class twice a week? because Jennifer is the best exercise instructor i have ever had." I am NOT a morning person, nor do I particularly enjoy exercising. So why do I get up for a 5:30 a.m. class twice a week? Because Jennifer is the best exercise instructor I have ever had. Using some basic moves, she crafts a different workout every day usually incorporating every muscle you have. She is knowledgeable about exercise and nutrition and is always available for questions or concerns. 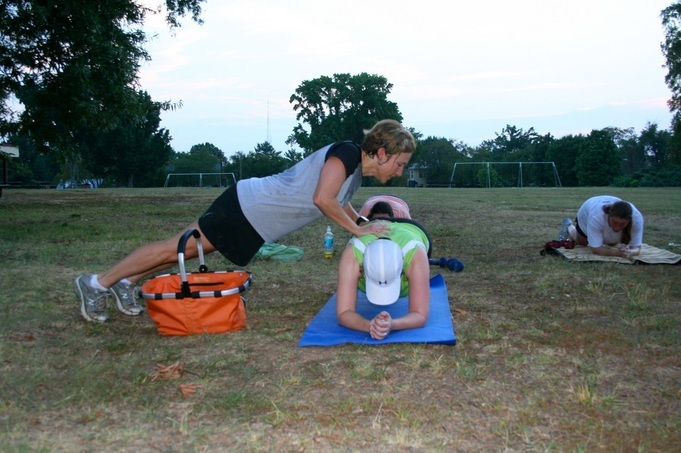 She makes exercise modifications -- often while still maintaining count! -- for each individual so that the class is challenging, but not overwhelming. Jennifer is encouraging when it seems like you will never be able to do a proper push up, and she is celebratory when you reach that goal. I am lighter, faster, and stronger after only a few months and I know that Jennifer is going to help me get the body I want. You have been such a motivator for me to get back into shape. I know you're going to keep me motivated no matter what life throws my way. Thanks again! ​"the scale said something very nice to me this morning that it had not said in about three years." I'm a new Mom. And the exercise I used to do doesn't seem to do anything about the weight I've put on since the pregnancy. Also, the older I get, the more aware I am that I need to establish a more permanent exercise regime to maintain my health and general strength. 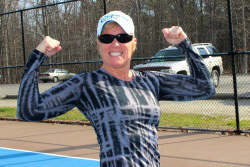 After having started the KYA boot camp workouts, I've already noticed my strength improving and my body responding. I think it's happy I've finally found an exercise regime that works for me. And, miraculously, my schedule, too. I was surprised that folks were prompt. 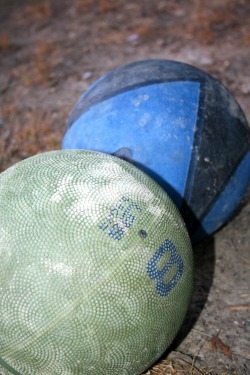 There was a good mix of ages, races, and physical ability. It helped that there was quite a bit of good natured grousing. Jennifer always gave people alternatives to doing stuff, in case it was too hard or too easy – which really helps. Jennifer is always motivating without ever being too perky (which I wouldn't be able to take that early) and was good at telling folks to stop and take water breaks if it was getting to be too much. It was really nice, for me, that we weren't in a gym. We did the ab exercises on our mats and I got to stare up into the trees the whole time, which was wonderful. But we also had a lot of privacy (who's out at 6 am, after all?). It's an ideal alternative to slogging it out alone at the gym. I've been saying for months that I just don't have time to exercise. Then I saw this and thought for the first time since I had my baby, "I could actually do that." And I have. I'm not sure why, but in committing to boot camp, I'm much more inclined to actually go. If I pay for a monthly membership at a gym, that's just not enough motivation for me to get up and get out there. KYA boot camp is different. “Maybe it's the energy of the group (instead of just myself), maybe it's Jennifer's straight forward approach and attitude, or maybe it's just that I can see everyone else actually managing to make it out and make the most of it... but I'm actually getting this done. Unlike other classes or memberships in the past, this one's actually sticking. It's a serious workout, an effective workout, but also one you can adjust to your own limits. No point in going once, pushing yourself too hard and then never going back. This is more about the long haul.